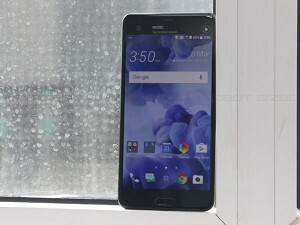 The HTC U Ultra was launched on 21st February, 2017 in India. The device features a big screen of 5.7 inches, made for the brilliant U. It reflects U beautifully with its sophisticated new liquid surface. HTC USonic analyzes the inner ears with a sonic pulse, and then adapts to you. The device has four high-sensitivity omnidirectional mics that capture positional sound in your video and audio recordings. The new selfie camera lets with easy switching between 16MP and UltraPixel. Choose between the unparalleled 4x light sensitivity that Ultra Pixel offers (perfect for candlelit dinners), and the high resolution detail that 16MP provides. The device is available in Blue and Black colors. The device comes with a 5.7 inches, quad HD with dual display pixel density at 513 ppi, with a screen resolution of 2560 x 1440 pixels and display type of IPS LCD. The display features Corning Gorilla Glass 5 with curve edge. The smartphone makes use of a 64 bit quad core Qualcomm Snapdragon 821 MSM8996 Pro, that is coupled with Adreno 530 GPU, 4GB RAM and 64GB storage as default memory capacity. This storage can be expanded up to another 2TB with the help of a microSD card. The device sports a 12MP camera at rear, enabling photos with less blur, super fast laser focus and PDAF. The rear camera also provides Auto HDR, Panorama, Hyperlapse, slow motion video etc. The front camera is equipped with 16MP, featuring Live make up, auto and voice selfie, and full HD 1080p video recording. The connectivity aspects include Wi-Fi 802.11 a/b/g/n/ac, dual-band, Wi-Fi Direct, DLNA, hotspot, v4.2, A2DP, apt-X, USB 3.1, Type-C reversible connector, with A-GPS, GLONASS, and dual sim (Nano + Nano). The smartphone packs a non-removable Li-Ion 3000 mah battery, with power saving mode and quick charge 3.0. The battery provides talk time on 3G/4G network up to 26 hours and standby time up to 13 days. The smartphone runs Android 7.0(Nougat) with HTC sense, out of the box. The sensors are Ambient light sensor, Proximity sensor, Motion G-sensor, Compass sensor, Gyro sensor, Magnetic sensor, Fingerprint sensor, and Sensor Hub. The U Ultra price in India starts from Rs. 27,990 for 4GB and 64GB variant. There are two Android Oreo firmware versions available for HTC U Ultra. It includes v2.19.400.1 which comes at a size of 1.32GB and there is another one with version number v2.19.709.2 weighing in at 1.58GB. The HTC U Ultra is powered by a Snapdragon 821 processor along with 4GB RAM and 64GB/128GB internal storage options. HTC U 11 that is slated to be unveiled on May 16 is likely to go on sale on May 19 for a lesser price than the HTC U Ultra. An YouTuber has put the HTC U Ultra Sapphire version under a scratch test. He has proved that the U Ultra screen is scratch resistant to a great extent.